Finite element analysis (FEA) is getting a bigger role in development projects, mainly because it helps reduce expensive prototype testing. In addition, FEA highly contributes to improving product integrity. Finite element analysis is a computerised method for predicting how a product reacts to real-world forces, vibration, heat, fluid flow and other physical effects. 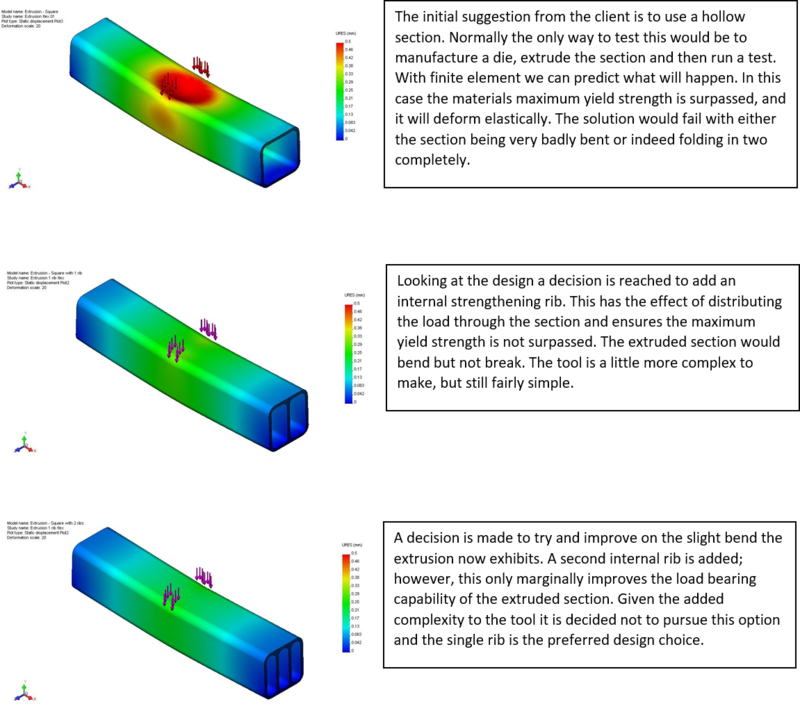 FEA highlights whether a product will break, wear out or work the way it was intended. It’s defined as an analysis, but in reality, it’s used in the product development stage to predict what’s going to happen when the product is actually used. FEA breaks down a real object into a huge number of finite elements, such as little cubes. The elements all have a mathematical defined relationship between force and displacement. Therefore, mathematical equations are used to help forecast the behaviour of each element. Then, a computer totals the individual behaviours to predict the performance of the object itself. What physical effects does FEA predict? A client uses a solid aluminium bar which is loaded in the centre. The bar does not deform; however, it is expensive, and the client wants to save money. In addition, there are other factors which could have been changed in this analysis. For example, we could have altered the wall thickness of the extrusion. Similarly, different alloys could be used with higher yield strengths and different temper cycles employed. FEA analysis would also allow us to model such conditions. Finite Elements Analysis (FEA) is a method for solving complex mechanical problems using the power of modern computers. Furthermore, our engineers can simulate reality whatever the situation or complexity. Direct results from our ability to carry out FEA analysis are profits with respect to time and also cost in the design phase. Likewise, it adds to the reliability of your product. Contact us on +44 (0) 2890 271 001 or email us at info@goudsmit.co.uk.